Group portrait of the New Detroit Committee taken outside of the McGregor Memorial Conference Center, Detroit. 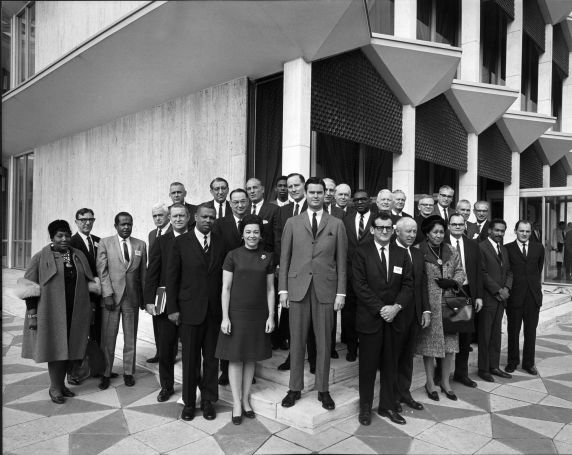 Photographers note: "The New Detroit Committee posed for its first official portrait at Wayne State University in a rare gathering of the city’s most influential civic leaders, Oct 11, 1967. " Left to right: Lena Bivens, Archdiocesean Opportunity Program; Ed Carey, President Detroit Common Council; Robert Tindal, Exec Sec NAACP; Richard Huegli, Managing director, United Community Services; Emil Lockwood, State Senate Majority Leader; Jack Wood, secretary-manager, Detroit and Wayne Building Trades Council; Judge Damon Keith, chairman Michigan Civil Rights Commission; Max Fisher, United Foundation chairman; Virgil Boyd, president Chrysler Corp: John Pingel, president Ross Roy Inc; Mrs, Gerald Bright, vice-president, League of Women Voters; Norvil Harrington, Inner City civil rights worker; Ralph McElvenny, president Michigan Consolidated Gas Co.; Joseph L. Hudson, president J.L. Hudson Co (chairman); James Roche, president General Motors Corp.; William T. Gossett, president American Bar Association; Arthur Johnson, deputy superintendent, Detroit Public Schools; Walker Cisler, chairman, Detroit Edision; James B. Ogden, assistant to UAW president Walter Reuther; Allen Merrell, Ford Motor Co., vice-president; John Armstrong, president Darin & Armstrong, Inc.; Rev Malcolm Carron, president University of Detroit; Mrs. Jean Washington, 10th precinct Police Community Relations Committee; Curtis Potter, Mayor Royal Oak; William Ryan, State House minority leader; William Day, president Michigan Bell; Delos Hamlin, chairman Oakland County Board of Supervisions; Rennie Freeman, executive secretary, West Central Organization; Paul Borman, president Borman Food Stores, Inc.